Where do you fit in dance education? 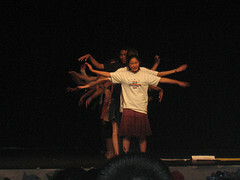 The dance world consists of many different scenes and contexts for learning. There are also a great many variations of philosophies, standards, and expectations. Dance teachers everywhere need to be able to communicate well with their students and think fast on their feet. Teachers in the public school, however, tend to have more bodies and more learning styles in a single class. The class dynamic reflects students with varied interests in the subject, varied experiences and skills levels within a single group, varied expectations of what a dance class should include, and then there are the social dynamics, otherwise known as the “drama”. Public classrooms represent a cross-section of a community and not just those that are able or willing to pay for dance classes. For these reasons, teaching in the public schools can be a great fit for the dance generalist — the person that enjoys and revels in dance technique, performance, choreography, history, production, ethnography, pedagogy, dance science, criticism, and dancer wellness. Often teachers in public school dance programs prioritize information differently than those teaching in private studios and may more closely relate to the principles of dance education found in college dance programs. Exploring fundamental technique and performance theory may be of more importance than focusing on styles of dance. Experiencing the creative process may be just as much about problem solving as it is about dance making. Investigating the amount of momentum required for a single pirouette versus a double may be more about a demonstration in physics than physical mastery. 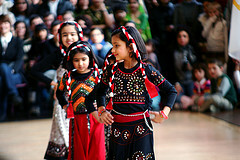 Cultural dance may be used to explore social studies and promote cultural sensitivity. State and national standards for dance reflect the values of this breadth of curriculum and its role in creating arts literate Americans. The articulation of what is important for (ideally) each American to know in dance is broken down into categories and grade levels yet leaves plenty of room for instructors to interpret how to apply these concepts into their teaching. As such, dance programs in the public schools can be as diverse as what we see in dance itself. Some schools strive for heavy arts integration where arts disciplines are used to support lessons in core subjects like English, Science, and Math. Other schools offer the arts with a more conversatory feel, in which students are expected to choose an arts “major” of sorts and are likely to pursue this line of study in college or the professional world. Still others attempt to find a balance of these approaches. 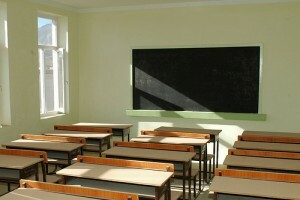 Classroom management in a K-12 setting is an art in and of itself. In private studios, classes can be structured to do one thing- produce dancers. 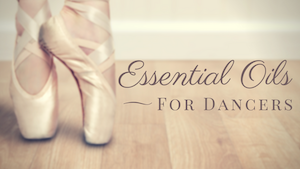 While other skills are developed, such as developing a passion for learning, enhancing social skills by being part of an ensemble, and respecting authority figures- in a school setting, dance classes must do these things intentionally. Often, in studios, students watch others to learn the procedures of “how” to take a dance class. Once that is established, rarely does it to be retaught. The culture of dance and how dance tends to be taught is really the only culture to be addressed. However, the first culture to be grasped in K-12 setting is specific to its function- that of an elementary school, a middle school, or a high school. The second culture to be understood is a classroom (even with open space, mirrors, and usually a slippery floor), and finally an arts environment. When teaching dance in K-12, it can sometimes feel like dance is the last thing you are actually teaching. Still not sure if teaching dance K-12 is right for you? What interests me most about my subject? What do I feel is most important for my students to learn? What are my goals in teaching? How much structure will I need from my teaching environment? A degree in dance, whether it be BA, BFA, MFA, etc. is not enough to teach in the K-12 world, you need dance certification from the State in which you are teaching. When you look up college dance programs in your state, look for them to list K-12 certification in their degree options. If you already have a degree in dance, and are interested in obtaining certification, some colleges or universities will allow you to do this as a post-bachelor program and will accept credits from your degree as satisfaction for the bulk of the program requirements, like transfer credits. You’ll also need to take some core classes in education. Find more information on K-12 Benchmark Standards on your state’s website, under Education. You can purchase the National Standards for Dance Education developed by the National Dance Association at www.ndeo.org. Teaching dance in the public schools, to me, is the most direct way to foster a love for dance in our society and to use what I love to produce and promote smart people and smart art. I don’t expect many of my students to pursue dance professionally but I do hope they will continue to watch, fund, appreciate, and advocate for dance wherever their lives take them. Do you want to teach dance in public education? What are your questions about the field? Thank you! I can’t accept your kind words without acknowledging Nichelle’s editing skills and ability to ask the right questions. I am glad you enjoyed the post and can attest to the importance of dance education! Thanks for commenting.